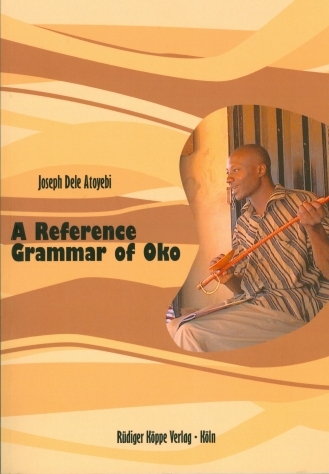 Author: Joseph Dele Atoyebi. Series edited by: Wilhelm J.G. Möhlig, Bernd Heine. 24 pp. Roman, 315 pp. The present study represents the first complete grammatical description of Oko, a language belonging to the Western Benue Congo language family of the Niger Congo phylum. It is assumed that Oko is distantly related to languages like Yoruba, Edo, Idoma and Ebira. The speakers of this language live in the communities of Ogori and Magongo in the Kogi state of North Central Nigeria. According to the most recent census of 2005, the total number of speakers in both communities is 39.252. Oko has two dialects: Oko, spoken in Ogori, and Osanyen, spoken in Mogongo. The differences between the two dialects are limited to minor phonological variations. The language examples are based on the Oko dialect, because it has much more speakers than Osanyen as well as a higher status. A third dialect, Eni, has been assumed by earlier studies, but cannot be approved regarding strictly linguistic viewpoints. The data for this grammatical description have been, on the one hand, taken from existing electronic databases and, on the other hand, collected from several research trips which amount to about seven months made by the author in both communities, Ogori and Magongo. There is no orthography for Oko available so far. Thus, one of the tasks of the present grammatical description was to propose a practicable orthography which applies to linguistic criteria as well as to the account of the native speakers. It is used – except in chapters 2 and 3 – in all examples of the study. The grammatical description is divided into four parts which deal with different aspects of the structure of Oko: phonology, morphology, the syntax of the phrases and the complex syntax. The appendix lists several original texts with interlinear translations and their transformations into English. Der hier besprochene Band bietet nunmehr eine gründliche, durch reiche Daten illustrierte Deskription des Oko, die in ihrer Konzeption vorbildlich für künftige Beschreibungen der vielen Hundert noch kaum dokumentierten nigerianischen Minoritätensprachen sein dürfte. Dies sei nicht nur vor dem Hintergrund der hohen Qualität der Analysen und des Materials sowie der Transparenz der Darstellung gesagt, sondern auch hinsichtlich der Einbindung lokaler Spezialisten. Der Autor hat diese Grammatik zwar am Max Planck-Institut für Evolutionäre Anthropologie in Leipzig verfasst, wo er als Forschungsstipendiat weilte, ist aber als nigerianischer Linguist in sehr verantwortungsvoller Form an der Entwicklung wissenschaftlicher Ressourcen und sinnvollen Kooperation mit der Sprechergemeinschaft interessiert gewesen. Dies ist der vorliegenden Publikation an vielen Stellen anzumerken. [...] Diese vielfältig nutzbare und hervorragend gestaltete Referenzgrammatik [...] bietet [...] einen vorzüglichen Überblick über die wesentlichen grammatischen Strukturen des Oko und dürfte damit für Afrikanisten und Allgemeine Linguisten eine große Bereicherung darstellen, da sie sowohl für komparative wie auch typologische Fragestellungen viel interessantes Material bietet. Es ist zu wünschen, das [sic] dieses vorbildliche Werk gerade auch in Nigeria vergleichbare Forschungen anregen kann.